The last time we visited the States we purchased this little gizmo to satisfy our craving for that early morning cup of coffee when we are without electricity. Today was that day. Just as we got out of bed this morning, the power went out and stayed off. After about an hour, it was well past time to make coffee and breakfast. We know many folks keep ground coffee beans on hand, but we don't. We buy small quantities of freshly roasted coffee and grind just the amount we need to get us through the day. This works perfectly when one has electricity. 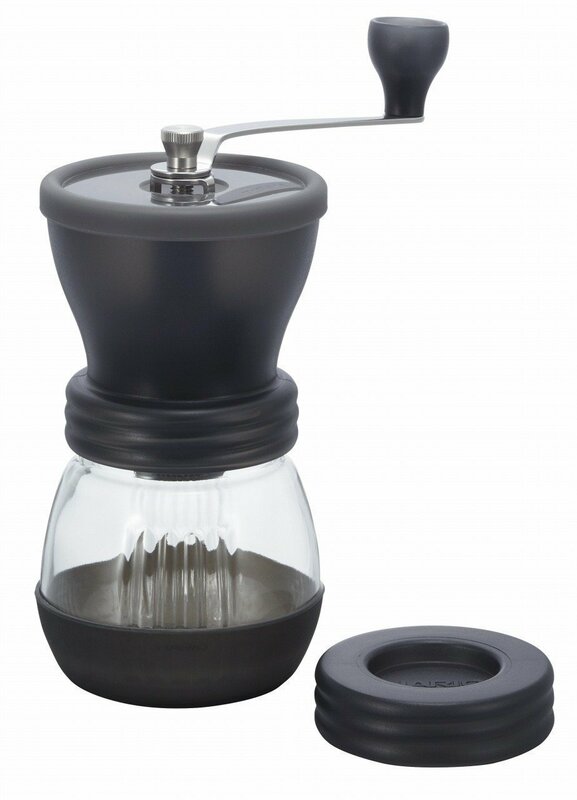 This little hand burr grinder is just the size needed to produce enough ground coffee for a full pot of Joe. I am pleased to report that between John and me, we have enough grinding stamina to get the job done in short order. The glass jar on the base of this unit broke during shipping, but it is properly threaded for a regular Mason jar. I attached the top of the grinder to a ½ pint jar and it works perfectly. After we ground the coffee, we boiled a kettle of water on our gas stove and brewed our coffee with our Chorreador de Café, just like we do everyday. The coffee was delicious and needless to say, 15 minutes after we poured the first cup, the electricity was restored. Ummmm ... the key words above are "enough grinding stamina." Holy moses, it takes a lot of turns on that crank to get enough for a big pot of coffee. I thought you had a backup generator. We do, but we try not to crank it over until we've been without power for more than a couple of hours. t can be simply utilized for littler amounts, in any case, on the off chance that you simply need 2 containers say, as opposed to a full pot.